Koga Mineichi was born in Saga prefecture and graduated from the Japanese naval academy in 1906. He rose quickly, in part because of family connections with the Imperial Household and in part because he was a genuinely capable officer. He graduated from the Naval Staff College in 1915 and served in staff positions and as naval attaché in Paris in 1926-1928. He then commanded a cruiser and a battleship before being promoted to rear admiral in 1932. He then served in important staff positions, including commander of Yokosuka Navy Station, and as commander of 2 Fleet. Koga shared Yamamoto’s pessimistic attitude towards war with the United States, but disagreed with him on the role of naval air power, remaining a strong battleship advocate until events proved the power of carriers. 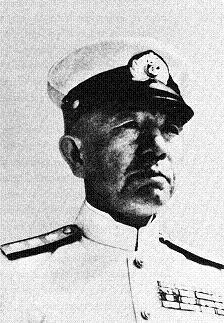 Commander of China Area Fleet at the outbreak of hostilities with the West, then of Yokosuka Naval Base, Koga became commander-in-chief of Combined Fleet on 21 April 1943, after Yamamoto was shot down by American fighters. Koga has sometimes been characterized as a cautious, conservative officer, but the plans he was formulating at the time of his death suggest otherwise. He planned an aggressive counteroffensive in the Aleutians that was foiled by the loss to explosion (probably from mishandling of munitions) of the battleship Mutsu and crippling by American submarines of the light carrier Hiyo. He then began reorganizing Combined Fleet along American lines, as task forces built around carriers, and organized a land-based air fleet to work in coordination with the carrier forces. He planned to conserve his forces to inflict maximum damage on the Americans when they closed in for the kill. Koga never had the opportunity to put his plans into effect. He was killed when his aircraft went down in a typhoon off Mindanao on 31 March 1944.